We started in the industry by producing high quality lighted props for all types of haunts and amusement parks. Since then, we have expanded into selling a large selection of Halloween masks and decorations. 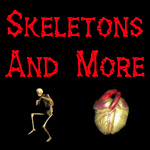 Check out the videos of Skeletons and More.